A common complaint about juicing is that it’s too expensive. After juicing regularly for several years I don’t think this is true. Just the opposite. I’m guessing the complaint mostly comes from people who are new to the practice and try and do a big fast too soon and drop $100+ on produce for a week. Daily juicing should cost about $20-$30 a week in produce. And personally it gives me the benefit of reduced hunger, so I have less cravings to gorge on other foods. My grocery bill comes out to about $85 a week including the produce I use for juicing. I don’t eat out very much. 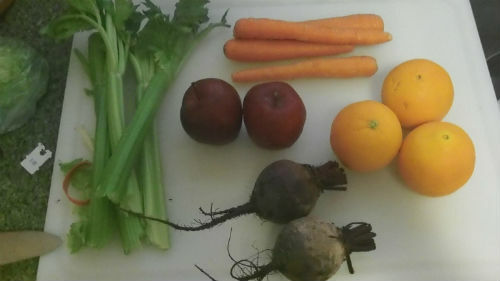 Above are the amount of each respective vegetable it takes to make 8 oz of juice. (This is using my juicer, your results may vary). Of course, I arrived at these results using my own juicer and using the prices at my own supermarket. As you can see, juicing is very inexpensive if you use a combination of apples, carrots, beets, and oranges as your base. Add ginger, greens, berries, and other soft fruits to accent the flavor. If you make 8-12 oz. a day, then you’re probably going to end up spending between $2-$5 for each drink you make. For a convenient and tasty way to eat your vegetables, improve your energy levels, reduce hunger and improve your different metabolic systems, that’s pretty darn good. This type of juicing is great but I had to laugh at the title. Of course if it had been read the other way it would be a complete lie. There is a real issue in the UK with store bought processed foods, people genuinely think that the frozen ready meal is better value than fresh produce and make from scratch, and that fruit smoothies are cheaper than fruit.